Carbon dioxide (CO2), introduced for insufflation by Zollikofer in 1924, is the most popular insufflant for laparoscopy under anesthesia (40). The absorption of CO2 has contradictory effects at different sites. CO2 is directly cardioinhibitory, reducing heart rate, cardiac contractility, and vascular resistance (41). However, CO2 also stimulates the sympathetic nervous system, and the increase in heart rate, cardiac contractility, and vascular resistance mediated by sympathetic nerves and circulating catecholamines counteract the direct effects of CO2 (42,43). Mild-to-moderate hypercapnia (excess of CO2 in the blood) during laparoscopy with CO2 pneumoperitoneum causes a mild respiratory acidosis (21,44). Severe hypercapnia induces more dramatic acidosis (see below), and the parasympathetic nervous system is also stimulated (41). Insufflation of gases other than CO2 results in a lower cardiac output for a given intra-abdominal pressure (35,36,45-47). FIGURE 3 ■ Elevation of diaphragm and restriction of lung expansion during pneumoperi-toneum. Source: From Ref. 122. If CO2 elimination does not equal the sum of metabolic production and absorption of CO2, hypercapnia and respiratory acidosis develop. 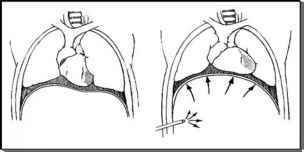 Hypercapnia can develop or persist after the conclusion of a prolonged laparoscopic procedure. absorbed readily. Of the gases used for insufflation during laparoscopy CO2 has the highest tissue permeance (Table 2) (49). Insufflated CO2 rapidly diffuses into the blood stream. The baseline production of CO2 in adults is 150-200 mL/min (50). During intraabdominal insufflation at typical pressures, CO2 is absorbed into the body at a rate of 14-48 mL/min (51). The amount of absorbed CO2 can be greater with increased intraabdominal pressure. CO2 absorbed or produced by tissue metabolism is eliminated by ventilation. CO2 is first hydrated to carbonic acid (catalyzed by carbonic anhydrase), which rapidly ionizes to bicarbonate and hydrogen ions (50). Bicarbonate is soluble in blood. Hydrogen ions reduce hemoglobin in red blood cells. Hemoglobin is reoxidized in the alveolar capillaries, and the hydrogen ions are released to bind bicarbonate, produce carbonic acid, and subsequently form CO2 and water for expiration. The vascular content of CO2 (estimated by PaCO2 or partial arterial pressure of carbon dioxide) is the "rapid" compartment of CO2 storage. The rise in PaCO2 is tempered by storage of CO2 in the "medium" (primarily skeletal muscle) and "slow" (fat) compartments. These storage sites can hold up to 120 L of CO2 (50). Therefore, not all of the absorbed CO2 is immediately available for elimination. In a patient with compromised ventilation, large amounts of PaCO2 can build up in the body and several hours may be necessary to eliminate the accumulation (39,52). 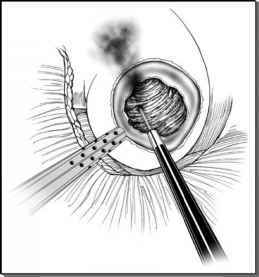 Hypercapnia can develop or persist after the conclusion of a prolonged laparo-scopic procedure (53). Cardiovascular effects of intra-abdomi-nal insufflation with CO2 are clinically insignificant in healthy and normov-olemic patients. With 15 mmHg pressure of CO2 insufflation, central venous pressure, systemic vascular resistance, heart rate, and mean arterial pressure increase. The effect on cardiac output may range from a decrease of 17% to 28%,to no net change, to an increase of 5% to 7%.